Every thing you need for Dentures! 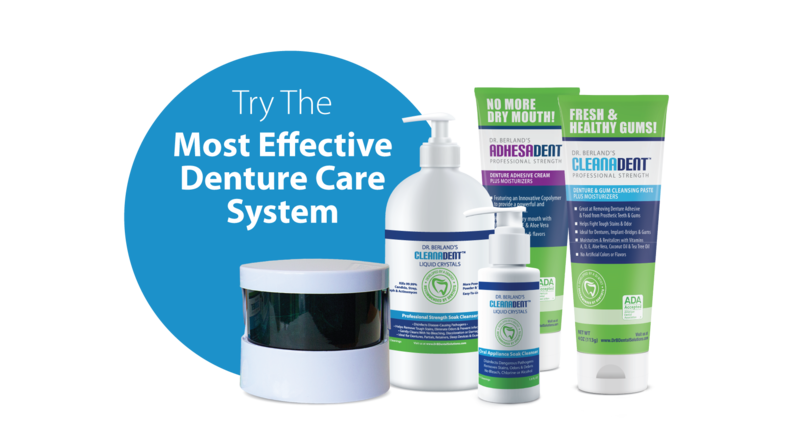 Save money by purchasing all of our products together, and enjoy a highly effective system for taking care of your dentures. These products were developed by Lorin Berland, DDS and are recommended by dentists around the world. Whether you are new to dentures and this is your starter-pack, or you’re just trying to take the best care of your existing dentures, this is the perfect introduction to Dr. B Dental Solutions. Adhesadent is the only denture adhesive that Reduces Dry Mouth and Soothes the Gums with Aloe Vera and Vitamins A, D &E. Adhesadent provides a strong long-lasting hold, yet is easy to clean. Adhesadent has the prestigious ADA Seal of Acceptance, Fixodent and Poligrip do not. Cleanadent Paste is the only cleansing paste specially designed for both the dentures and the gums. Reduce Dry Mouth and Sooth the Gums with Aloe Vera, Vitamins A, D & E, Coconut Oil and Tea Tree Oil. Use Cleanadent Paste with an extra-soft tooth-brush to clean and remove adhesive from your dentures and gums. No artificial flavors, just a gentle, natural taste that refreshes and moisturizes! ADA Acceptance Pending. Cleanadent Liquid Crystals is the only soak cleanser that kills pathogens like Candida, Streptococcus, Staphylococcus and Actinomyces without the use of harsh chemicals like bleach or chlorine. These pathogens are extremely prevalent on oral appliances, and millions of people suffer from long-term infections. The Cleanadent Liquid Crystals also helps eliminate odor and remove tough stains. Safe on Soft Liners. Unique & easy-to-use pump delivery mechanism. Economical – 45 cleanings per bottle. ADA Acceptance Pending. Dr. B Sonic Cleaner uses high-frequency sonic waves to help loosen debris, and helps the Crystals solution penetrate the porous material of oral appliances to provide a deep clean on a microscopic level. Great at removing biofilm to prevent pathogen recolonization. Dentists almost universally recommend using a Sonic Cleaner, and patients love it! For best results, follow the instructions on our Cleaning Tips page & watch Dr. Berland explain the products on our YouTube Channel! Real Customer Testimonials – to see what more people are saying, check out our Testimonials page. “Thank you! I love love love your products! Best adhesive and cleaner I have ever used! They actually make wearing dentures not so bad! I just started using these products (Adhesadent and Cleanadent) they have changed the way I feel about my dentures. The adhesadent holds for about 24 hours and the cleanadent makes it so easy to get them clean no more sticky mess. I love these products and highly recommend them!” Eileen L.
“I have completely replaced all my denture products with yours! !” Kayla B. “The best! I know I’m safe and protected with these products! The cleaning crystals are life for me! No way, no how would I use any other otc cleaning crystals or tablets! It only takes a pea size amount to clean your mouth and teeth! You can use the cleaning paste while your teeth are in your mouth! I also spread a thin layer of the paste on my denture teeth and let it sit and whiten for a while. It works great! I’ve tested the adhesive 4 separate times and each time it’s lasted 24 hrs and is just as strong as when it was 1st applied! Best of all – you’re free from bacteria and fungus and no dry mouth!” Pamela W.
“I recently purchased all the products and am very happy with them. I am a new denture wearer and I was suffering from a very dry mouth. The products have helped tremendously!” Connie B. “Everything Dr. Berland has is amazing! I am currently using the Cleanadent and the Adhesant, and I love them both! I won’t be using anything else!” Stephanie S.